Microsoft Earnings: Can Microsoft Continue to Deliver? Shares of software titan Microsoft (NASDAQ:MSFT) have continued to rally thus far in 2014, even as it still struggles to counter opponents like Google in mission critical areas such as mobile. 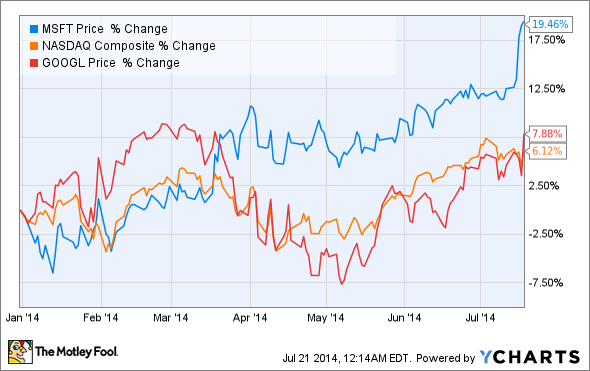 That hasn't kept Microsoft shares from handily beating Google stock year-to-date. And later this week, Microsoft earnings should provide investors with another widely anticipated update at a time of massive change at Microsoft. Analysts are modeling for Microsoft earnings to present investors with somewhat of a mixed bag; sales should grow, while profits should lag. However, there are also other key storylines that will likely loom just as large as Microsoft earnings numbers, most notably the recent round of massive layoffs Microsoft announced last week. Most importantly though, Microsoft investors should be laser focused on any update regarding Microsoft's ongoing mobile turf war against Google. Google now dominates the global smartphone and tablet markets that Microsoft also covets. Microsoft's key strategic focal points in its efforts to subvert Google's dominance are (unsurprisingly) mobile and the cloud. However, Google still enjoys several key network effects that will make grabbing meaningful share difficult for Microsoft in the years ahead, an important theme for investors. In the video below, tech and telecom specialist Andrew Tonner discusses the specific numbers and issues investors should watch for during Microsoft earnings later this week.